When you strip down a piece of music, meant to be performed by an orchestra, concert band or choir…you find multiple sections of notes, melodies and phrases that sound hollow and empty when separate, but form a harmony of sounds when performed to perfection by an ensemble. Thus, an ensemble can be considered a body, operated by individual organs. Hibike!’s TV series perfectly encapsulated this aspect of daily life with a sense of subdued intensity and genuine passion, whilst also producing a work that exemplifies human drama at its most simple and complicated. So how does this single OVA episode build from that? 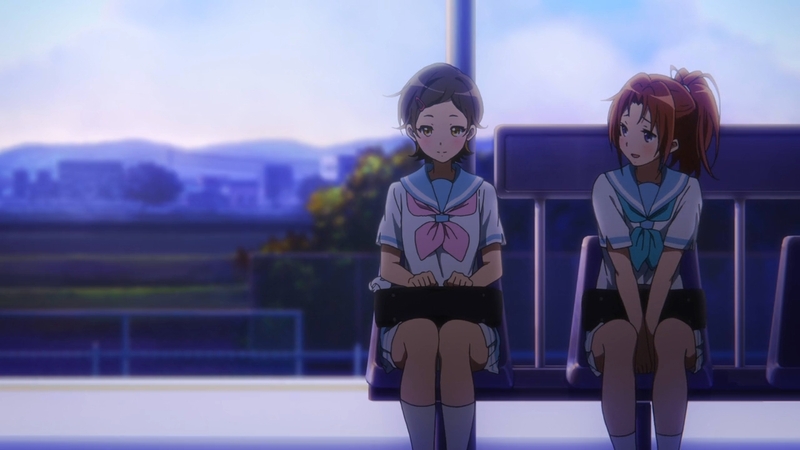 What can be considered to be the weakest element of the series; the romance triangle between Kumiko, Shuichi and Hazuki; was given more time to flower in this short 20 minutes. But rather surprisingly, against the backdrop of the increased intensity in the band’s atmosphere towards the lead up to the competition, and the recent rejection of a proposal of love, instead of focusing on mindless bickering and self-pitying, Hazuki’s character truly shines through as she attempts to throw herself into the cheerleading trenches for both the band and for Shuichi’s seemingly one-sided love. Put simply, Hazuki is the genki trope done right: she’s realistic in her optimism, unwilling to show her sad side, but willing to admit it, when she realises her need for emotional support from her friends and an ability to find new goals to work towards, and ways to support the friends that helped her find a sense of comradery in the bass session: the ability to harmonise with friends as a small ensemble is an endearingly intimate and beautiful experience which can only be shared between true friendship. 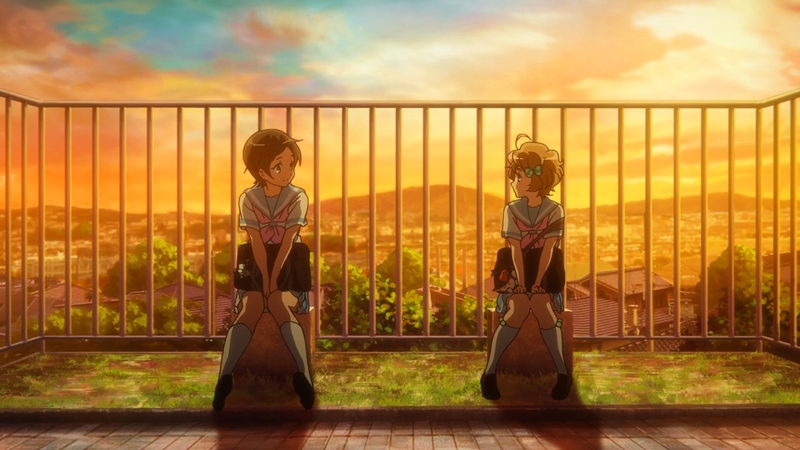 The highlights of the OVA were essentially extended flowerings, stemmed from the seeds planted from the original series: Hazuki’s interactions with Sapphire, Natsuki and Shuichi throughout the episode forms the backbone of this side story, and it sorely depends on your knowledge and sense of understanding towards these characters, your attention to detail and the ability to follow KyoAni’s subtle framing of relational climates between characters, and their subtle expressiveness beyond just facial expressions and dialogue. Sapphire’s reminder to Hazuki, that she was brave beyond human capacity, when she proposed and took the rejection head-on; was a simple throwaway line, but the camera’s close-ups of Sapphire’s expressions of intense genuinity and Hazuki’s shocked face that was etched with bittersweet gratitude, was made all the more memorable, when you consider the mirroring of Sapphire’s encouragements of ‘no regrets!’ and Taki-sensei’s opening comments, to take their failure of making the cut during the auditions, as a chance to further improve themselves, and to consider their situations as a tactically advantageous one: the bitter taste of failure is a source of motivation that is lacking in the students who made the cut. It’s all a matter of perspective. Natsuki has always been a favourite of mine from the TV series: her sparing presence were etched with memorable moments of goofiness and a sense of a upper-classman who has finally found her source of inspiration and the desire to support her juniors. What’s so endearing about Natsuki’s character; as supposed to the positive front put forward by Asuka to hide her more unapologetic side; is her ability to provide a source of warmth for her fellow section mates; one that isn’t showered with spotlights of gratitude. 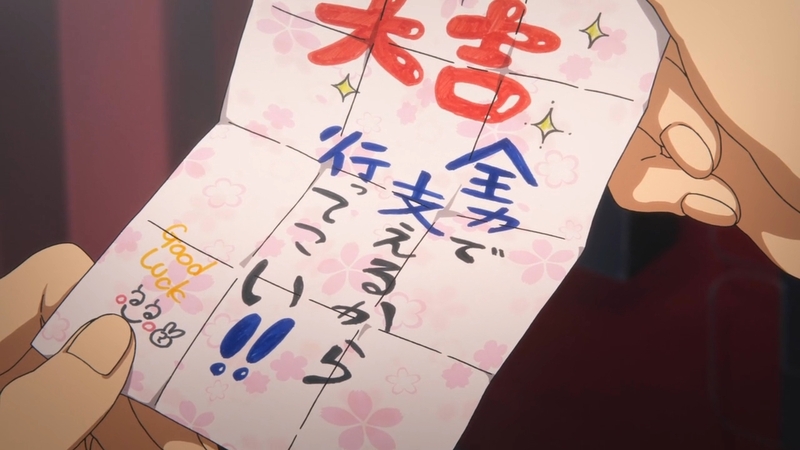 Natsuki’s actions, such as signing messages of inspiration on Kumiko’s music sheets, her simply putting an arm around Hazuki’s shoulder backstage, and embracing her in a hug on a whim on the way home, speaks volumes about her character: a good friend who supports you without being predictable and obvious. The OVA extends our scope of her impact on Hazuki’s outlook on band life and acts as a magnifier for the emotional significance of Hazuki’s interactions with Natsuki backstage, as they quietly cheered their bandmates on in episode 13. 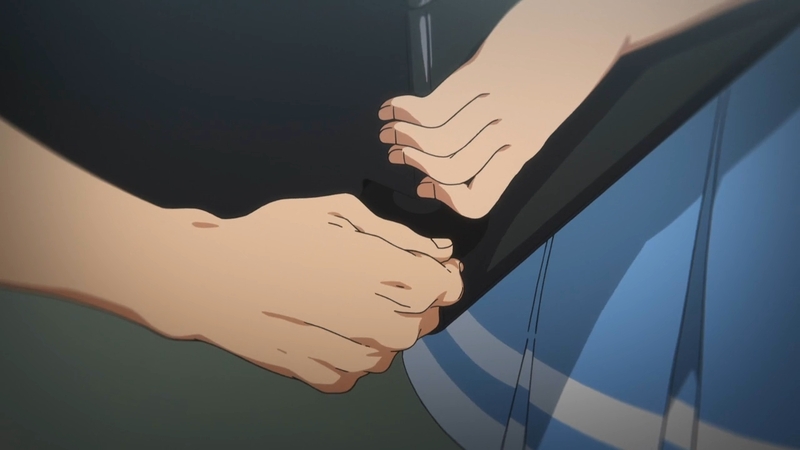 Other little nuggets of gold are simply spread around for fans of the series to pick out: why did Hazuki quickly adjust her grip on the tuba case when her and Shuichi’s hands touched for a split second? Why did Hazuki smile suddenly when she spied kids playing ‘Twinkle Twinkle Little Star’, and why did she encourage herself to run faster by commenting on a tubist’s lung capacity? Needless to say, KyoAni’s work on the series is top-notch: a great control of subdued digital polish, lighting control and general fluidity in animation. The background art were borderline visually poetic in their intense details and selective colour palettes of the sunset’s orange hues, and the blueish coolness of twilight. The background music were directly borrowed from the subdued and theme-based OST of the TV series, supporting and adding the needed polish to each scene they were utilised in. As an OVA, this is an episode which you can enjoy alongside the TV series: it is a subdued but impassioned piece of artwork, made from a studio that greatly respects humans’ interactive nature: interesting things always happen when you just allow characters to interact like human beings, a point you may have detected from miles away, considering the general subject matters of my image inserts. What a way to finish before Christmas, eh? (Side note): I am currently working on an extended analysis and research piece on the inner workings and details of the Hibike! 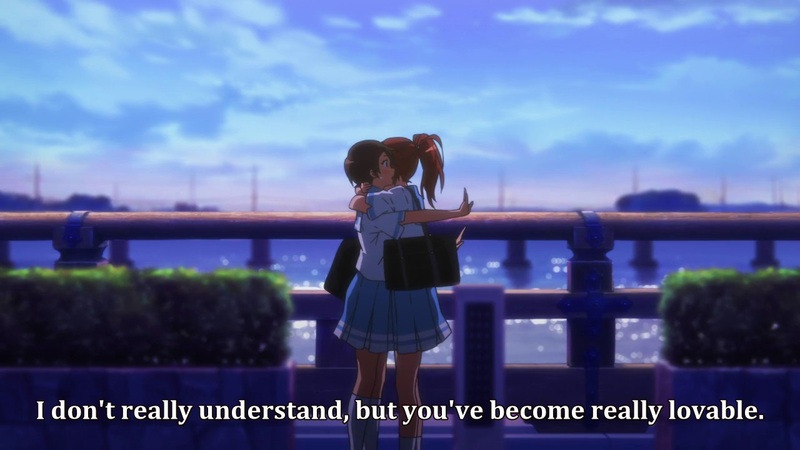 Euphonium TV series. Hopefully I can publish it some time in the first half of next year and indulge the readers on the show, that has since climbed to the top of my ‘favourite anime’ list (literally…it’s my #1).